A group of well-branched specimens. They are not easily seen from a distance; their presence being detectable only through a general darkening of the area. Your Author had photos of the whole group of maybe 100 to 300 plants about 15 yards across but you would not be able to see them on so small a photo area. Several specimens growing in close proximity. Some specimens are well-branched, the branches being in opposite pairs and curving upwards to be upright and close to the main stem. 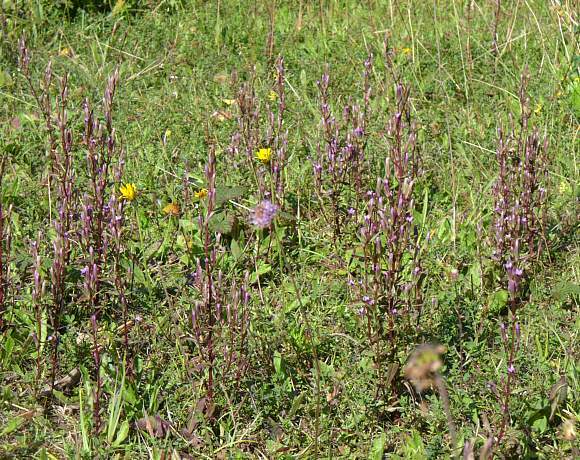 A short plant, up to a foot high, gathers in small separated clusters. 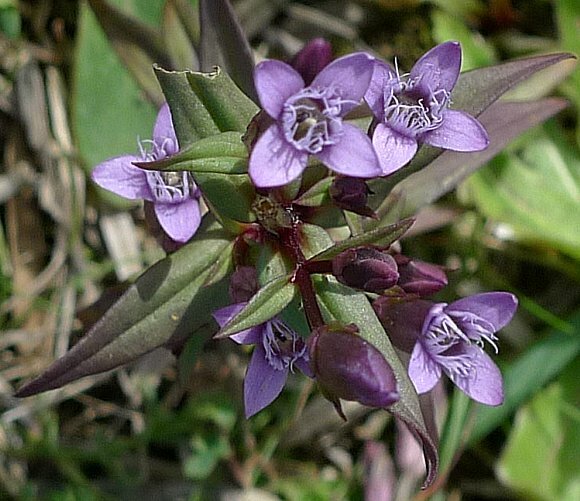 Has mauve flowers, with usually five petals. A very squat example showing upper leaves and lower leaves. Note the smaller flowers still encased within the green sepal cups near the foot of the plant. Thus every stage of the flowers apart from the seeding stage is present on this specimen. Flowers branch off from the main stem on short stalks in pairs at the leaf axils. Leaves in opposite pairs and without stalks: they are attached broadly to the main stems. 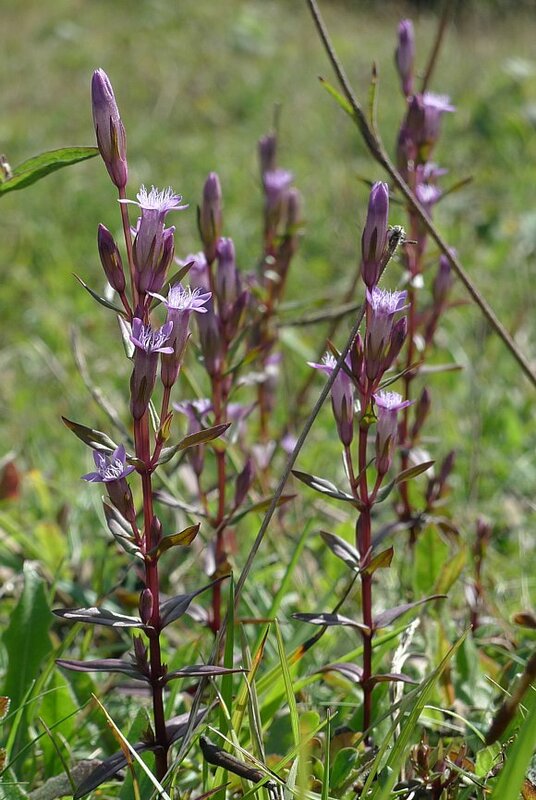 Mauve coloured flowers distinguish it from the otherwise similar Field Gentian which has pale blue flowers. 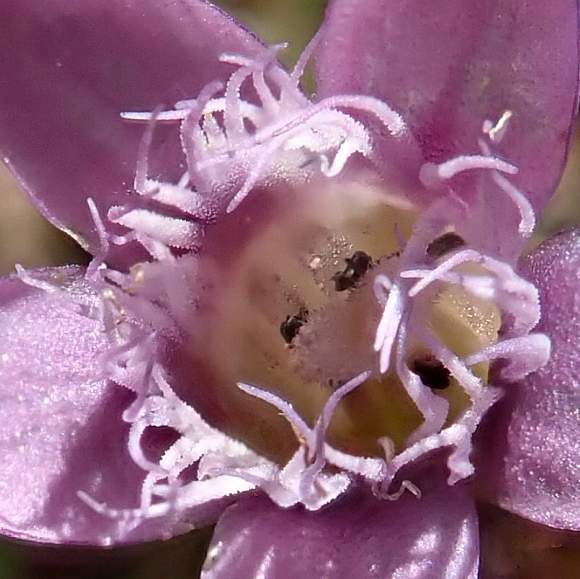 This specimen has both five and four petalled flowers on the same plant. 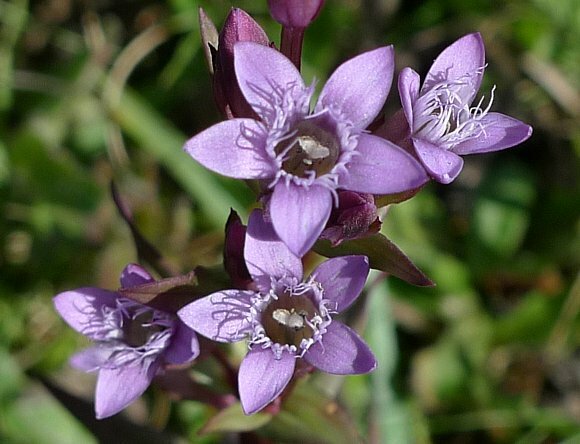 As usual for Autumn Gentian, some plants have only four petals. 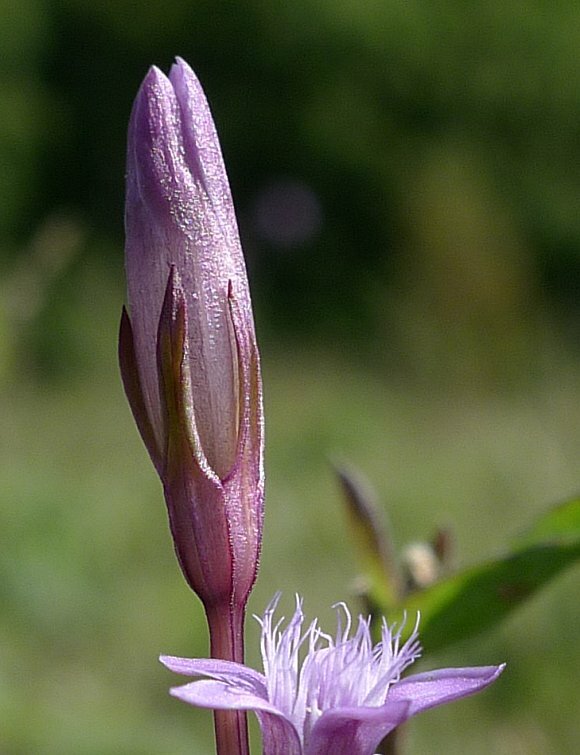 On some plants, there are both four and five petalled flowers. Another 4 petalled version. Your Author cannot quite figure out what that protrusion from the top of that floret on the right is. The beginning phase of the fruit? Has the flower opened and now closed up? Yet another 4 petalled version. The coronal ring of ribbons have fine serrations. The pollen seems to be indigo coloured. Central parts of flower fairly well hidden from inspection. The stigma is white and splayed into two atop the hidden white style. The anthers are brownish on this photo. Petals first broadening before tapering to a point. On this white-on-the-inside version the pollen is definitely cream coloured. 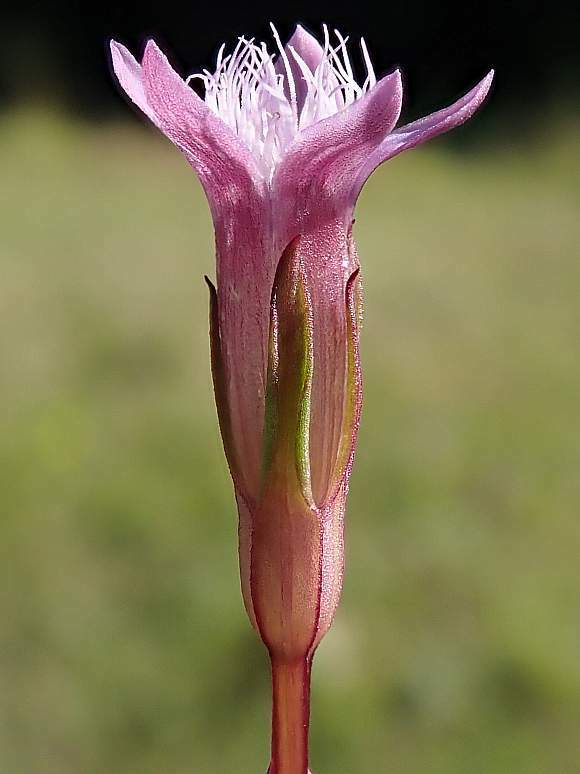 Flowers consist of a long tube which opens out into separate petals only near the very top. A coronal ring of white or lilac tapering ribbons protrudes from the top. Five very long sepals only tapering to a point near the ends. Flower stalk four-square. As above but with the petals splayed open. The white 'threads' are not styles. Lurking somewhere within are the anthers and style. There are white 'threads' which are minutely toothed on their edges around the edge of the corolla - presumably there to deter entry to some insects. Leaves are light green to reddened, and triangular, gradually tapering to a point after initially sudden widening at the stem end. 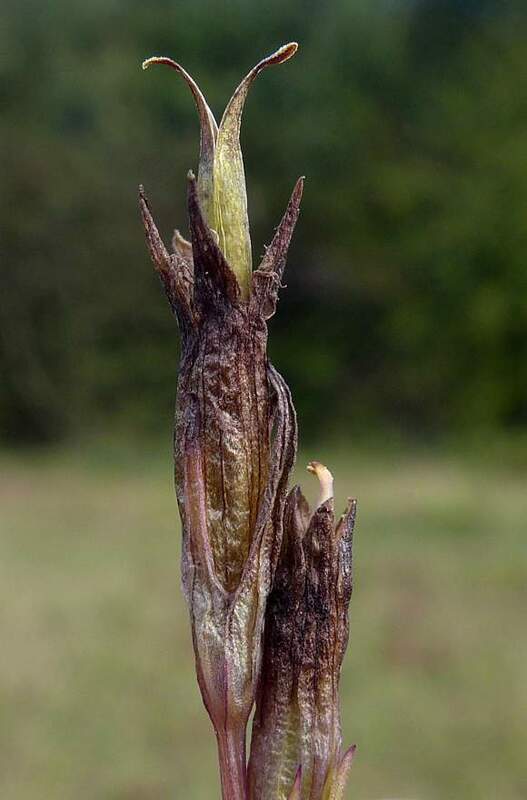 The pale-green tube with the 2-splayed end poking out of the now brown corolla tube and brown petals which is in turn nested within the brown sepal tube with long sepal teeth is the seed pod, which contains numerous tiny seeds. 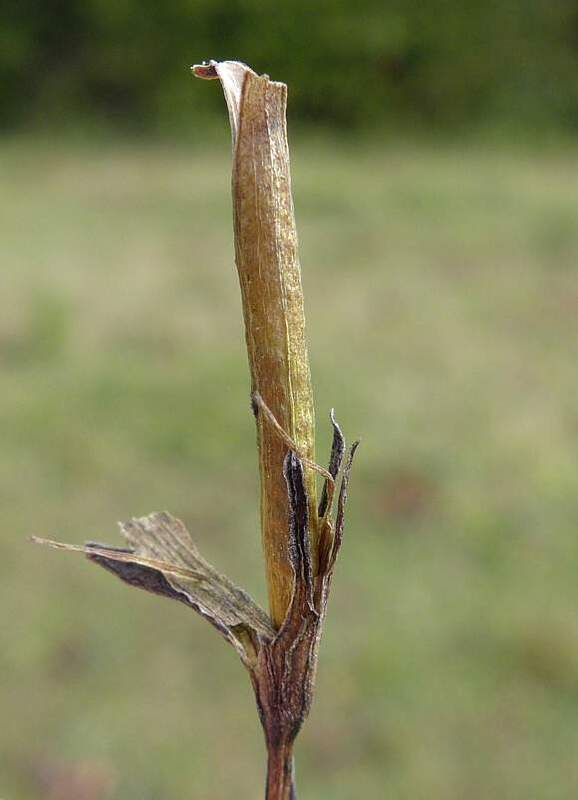 Your Author tried to peel away the sepal tube so as to reveal the full extent of the seed pod but also inadvertently also removed the one of the two tips of the seed case (and bent the other). It is long and goes to almost the bottom of the sepal tube. The numerous seeds are tiny: those grooves on my palm are my palm-prints (the same width as the ridges on your fingerprints). There were nany more seeds in the seed pod than what are shown here; many blew away in a 4mph wind before landing on your Authors palm whilst others blew off whilst on it! 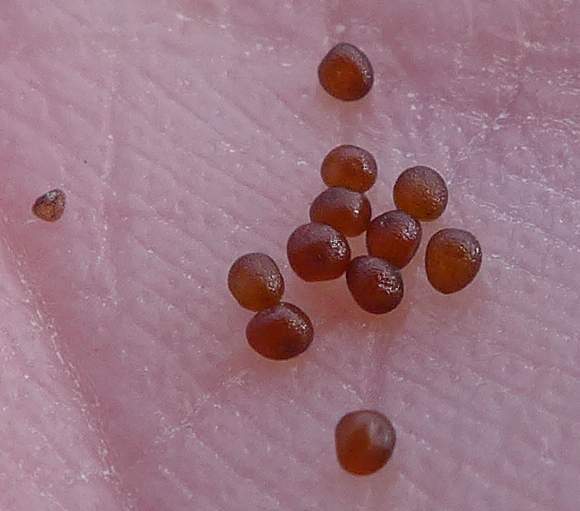 They seeds not quite spherical and dimpled like golf-balls (but minutely so). Your Author hazards a guess that they are roughly 0.7mm across; but he does not possess a micrometer nor vernier gauge - least of all one light enough to carry everywhere in his hiking rucksack on the odd occasion he might need it. 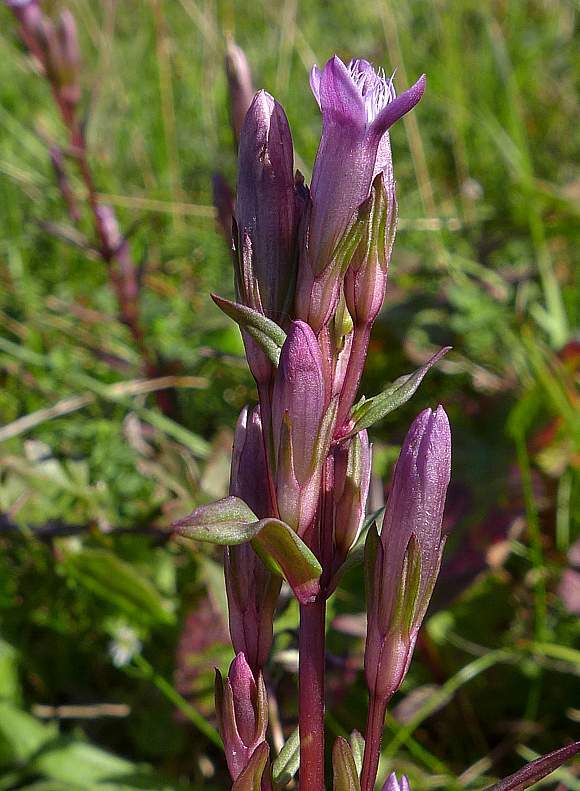 Chiltern Gentian ( Gentianella germanica ) to produce ( Gentianella × pamplinii ) which is highly fertile (50%). 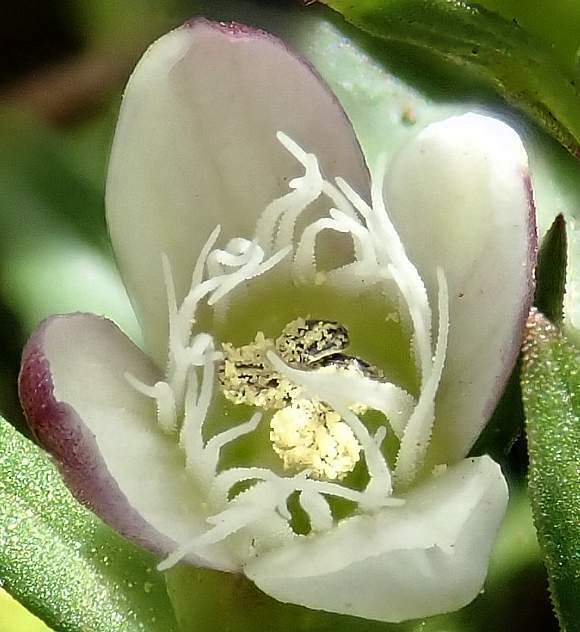 Gentianella amarella subsp. amarella which has main stems with between 4 and 9 branch-pairs and is frequent is locally frequent in Britain south of Angus. 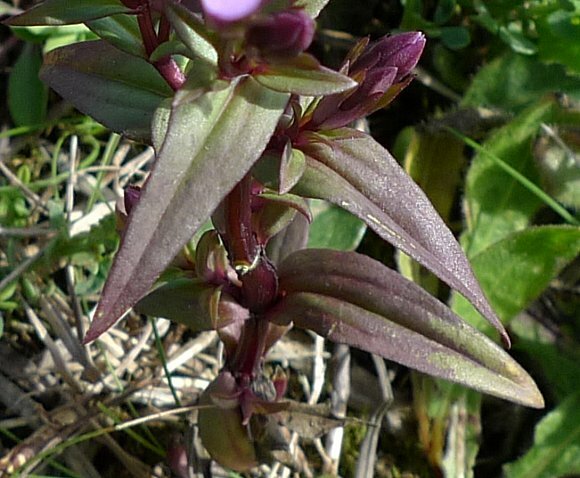 Gentianella amarella subsp. hibernica present in only very few locations north of Scarborough, and a few extra locations in Western Ireland. This subspecies is usually narrower leaves which are less tapered than the above and has between 7 to 11 branch-pairs on the main stem. It is a [RR] quite rare. Gentianella amarella subsp. septentrionalis with an interrupted presence north of Lancaster. This has only between 2 and 7 branch-pairs on the main stem. This subspecies is also a [RR] quite rare. 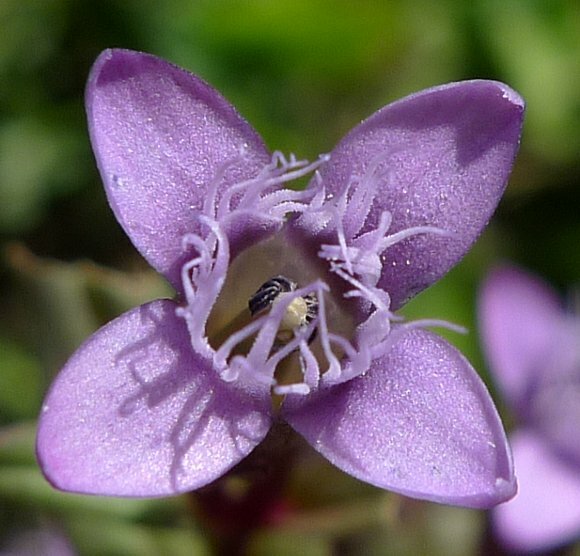 Gentianella amarella subsp. druceana . This has only between 2 and 5 (unusually 6) branch-pairs on the main stem with narrower leaves. This subspecies is also a [RR] quite rare but should maybe be taken as ssp. septentrionalis. None of the above photographs are anything but pure Autumn Gentian, since none occur anywhere near the location of these specimens. Some similarities to : Field Gentian ( Gentianella campestris ) but this has paler and bluer flowers than Autumn Gentian, often being almost white. 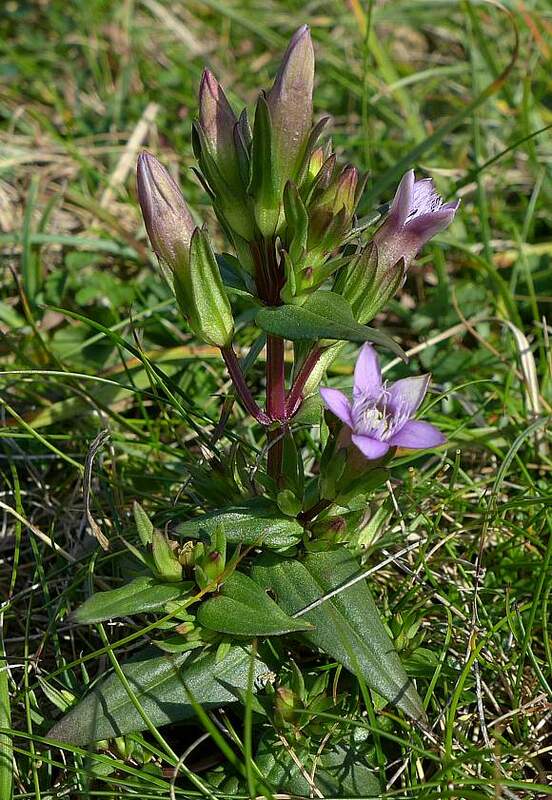 Field Gentian also always has four petals whilst Autumn Gentian usually has five (but can have four even on the same plant). Some resemblance to : Centauries such as Common Centaury (Centaurium erythraea) but that has smaller pinkish flowers and to Yellow-wort (Blackstonia perfoliata) but that is yellow. In flower from near the end of July to just after the beginning of October. 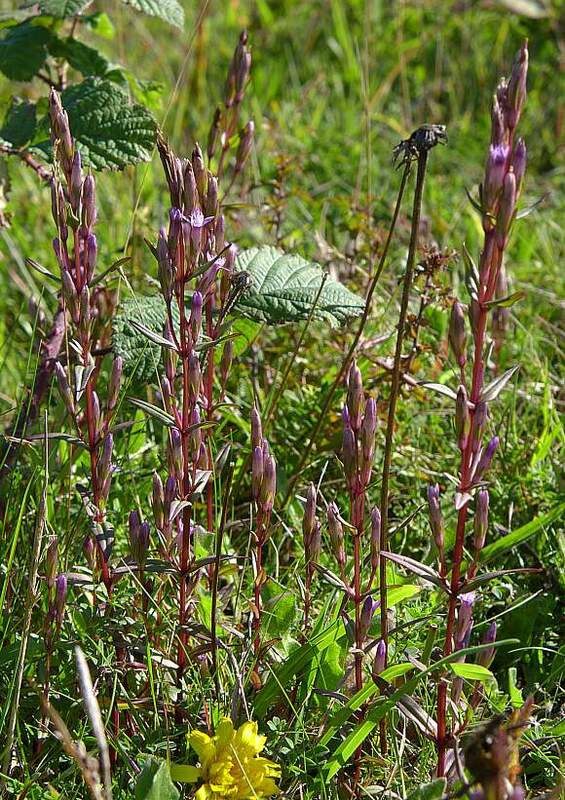 Habitat: grows on old sand dunes and on alkaline grassland, such as limy soils. As shown here it is growing on an ex-alkali works, now an SSSI. 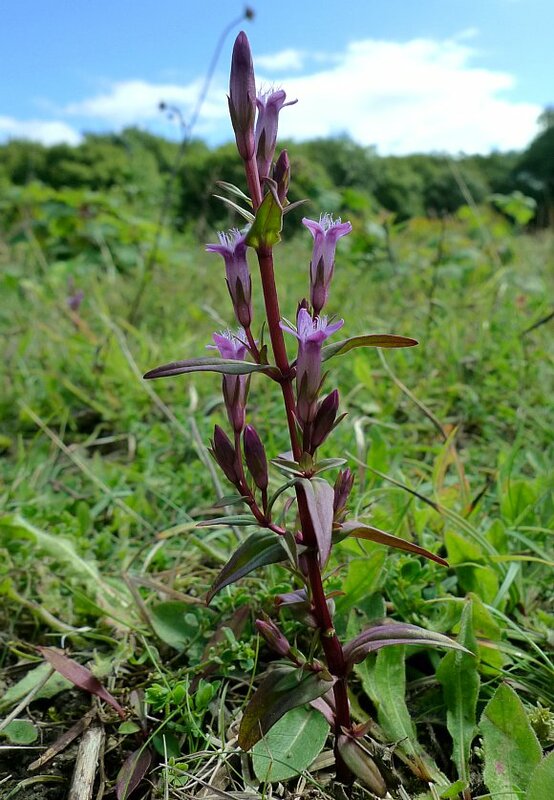 Many of the natural chemicals below are to be found not only in Autumn Gentian, but also in many other members of the Gentianaceae Family, as well as many other similar compounds which are not found in Autumn Gentian. The roots of Autumn Gentians contain: the yellow Gentisic Acid (5-dioxybenzene), and at least four xanthones: Gentisein (1,3,7-triHydroxyXanthne) [note - Gentisein should not be confused with Genisteine, which is an isoflavone], Gentisin (1,7-Dihydroxy-3-methoxyxanthone), and the very bitter xanthone glycoside Gentiopicrin (aka Gentiopicroside). 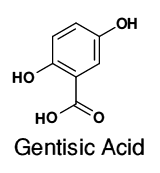 The yellow Gentisic Acid is present in the roots of Autumn Gentian and is a derivative of Benzoic Acid , being dihydrobenzoic acid. In the human body it is a minor metabolic breakdown product of aspirin, and is excreted by the kidneys after aspirin has been taken. The potent anti-oxidant activity of Genistic Acid may account for the anti-atherogenic properties of aspirin. (That is, it is useful against the atheromatous plaques which accumulate on the walls of blood vessels in atherosclerosis). 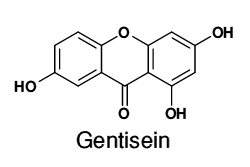 Xanthone itself has no reported presence in the Gentian Family of plants, and is shown here only for comparison but the derivatives of Xanthone shown below it are all present in Spring Gentian. Xanthone itself acts as an insecticide and is used as an ovicide to kill the eggs of Codling Moth s, and as a larvicide to kill larvae. Xanthone derivatives are often brightly coloured, such as the yellow-coloured LicheXanthone found within some lichens. 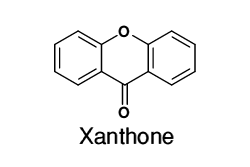 ( Xanthene s, on the other hand, are similar chemically, and often used as dyes, but are not present in Gentians). 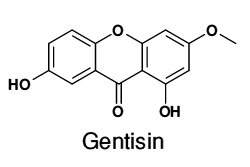 Gentisin is mutagenic and also exhibits strong Monamine Oxidase Type A and Type B inhibition. 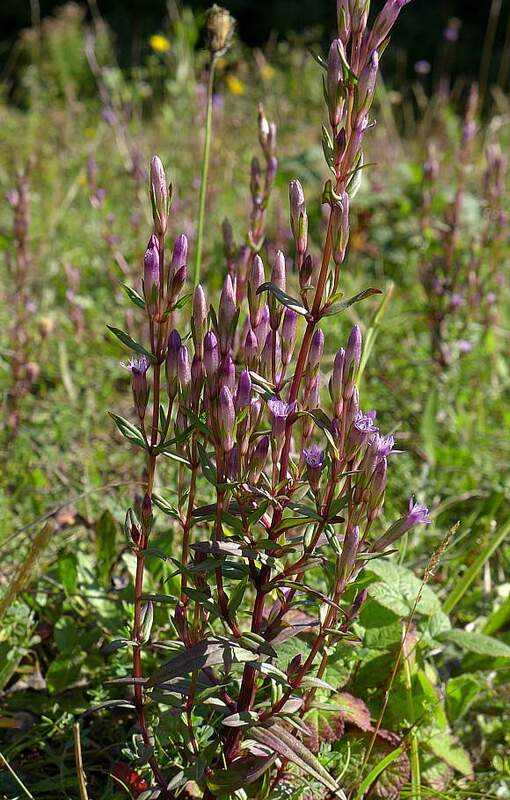 Several other xanthones have also been isolated from Autumn Gentian. 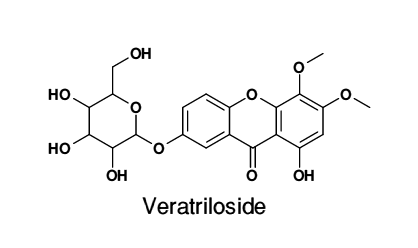 The xanthone glycosides, Veratriloside, Corymbiferin 1-O-glucoside, Swertianolin and Norswertianolin along with two newly discovered xanthone glycosides: Corymbiferin 3-O-β-d-glucopyranoside and the glycoside of a dimer of xanthone: Swertiabisxanthone-I 8'-O-β-d-glucopyranoside (shown below). 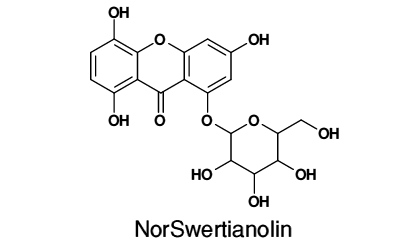 Swertianolin (above) is the 8-O-glucopyranoside form of Bellidifolin (not shown), which exhibits Monamine Oxidase B inhibition. 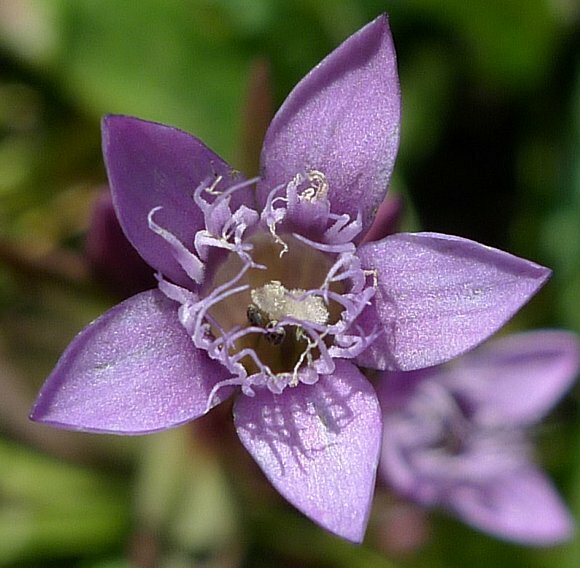 In the Indian system of medicine, the presence of Swertianolin and Norswertianolin in the non-native (to the UK) plant Swertia purpurescens are attributable to its medicinal properties. 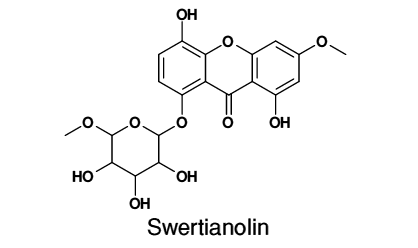 Also present are the xanthone glycoside Triptexanthoside C and a xanthone dimer Swertiabisxanthone-I . The prefix seco- derives from the Latin secare which means cut and in chemical nomenclature denotes the cleavage of a ring by the addition of one or more hydrogen atoms. The Secoiridoid compounds are variations on the iridoids, which are terpene derivatives and contain no nitrogen. 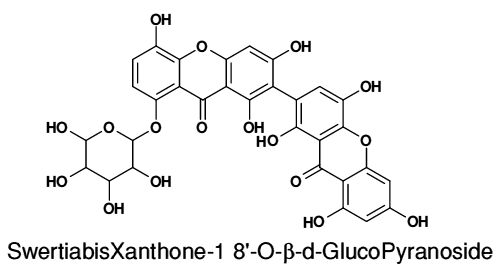 The secoiridoid glycosides are present in greater amounts than the xanthones. 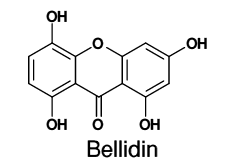 There are many other Secoiridoid Glycosides. 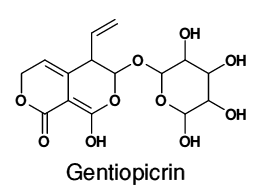 Gentiopicrin is synonymous with Gentiopicroside, and has analgesic effects useful for persistent inflammatory pain. It is widely used as a gastric stimulant, specifically for dyspepsia and gastric inflammation, but also for hepatic and gall-bladder disease. Also as an adjunct to chronic inflammatory disease. 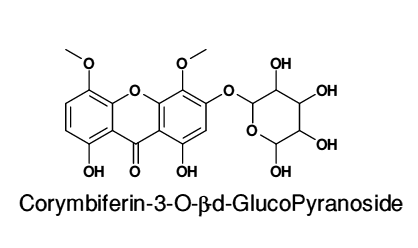 Gentians are intensely bitter which is due to the secoiridoid glycoside compound Amorogentin , even though Gentiopicroside, another bitter secoiridoid glycoside, is present in much greater amounts. This as the result of amorogentin being 3000 times more bitter than is Gentiopicroside. 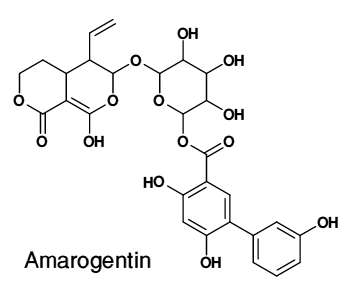 Amorogentin may find use as a treatment for Leishmaniasis. 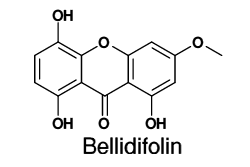 Gentiodelphin is an anthocyanin blue pigment present in Gentian flowers. It has the anthocyanidin Delphinidin (shown in cyan) at its core, surrounded by three glucose moieties (shown in red) to which two Caffeic Acid groups are attached (shown in green). 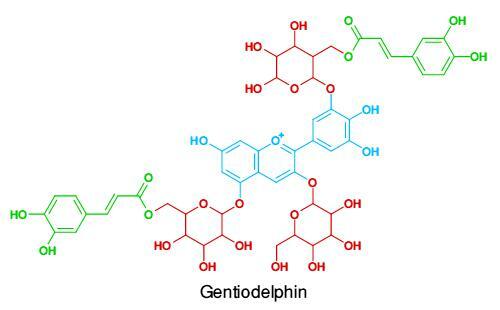 Gentiodelphin is unusually stable - the extra units surrounding the anthocyanidin help to stabilise the molecule. Gentiodelphin is a deep-blue colour. One of the Caffeic Acid moieties bestows upon it that extra blueness typical of gentians. 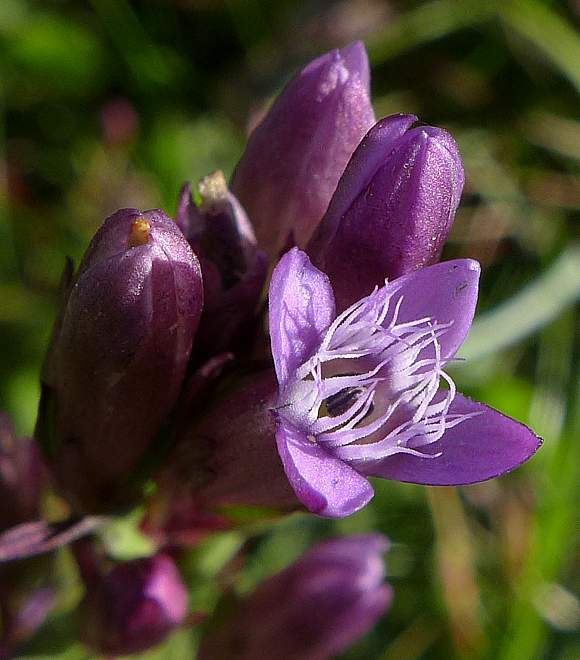 The deep violet dye Gentian Violet used in the biological laboratory is NOT contained within Gentians, but is rather named after the colour of Gentians. 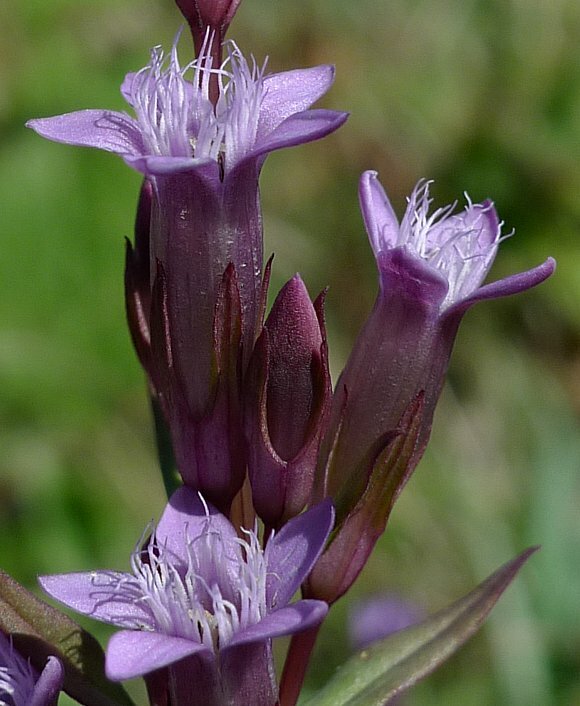 Gentian Violet is also a fungicide and anti-septic used to treat skin fungal infections and wounds, but stains the skin a bright purple so is not used as much now as it used to be; there are less conspicuous and more effective alternatives. 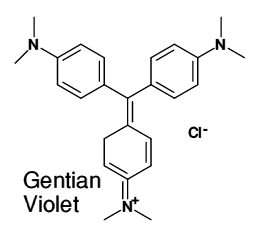 Gentian Violet (aka Crystal Violet and Methyl Violet 10B is one of a family of three differing Methyl Violet dyes, the other two being Methyl Violet 2B and Methyl Violet 6B. 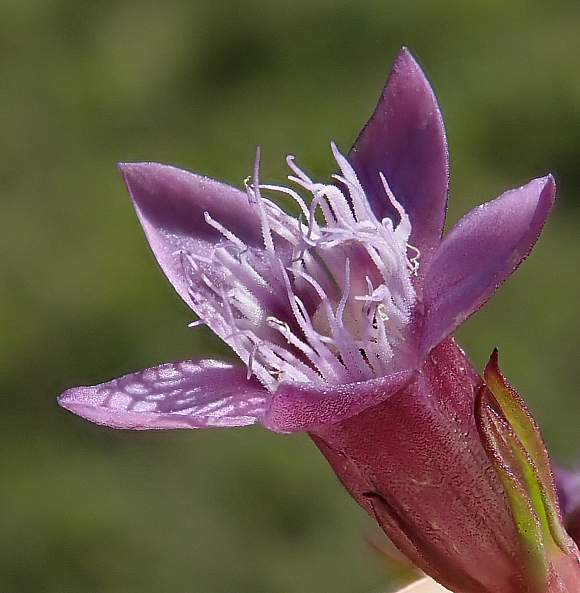 Indeed, the name Gentian Violet once referred to a mixture of Methyl Violet dyes, but now the term is used solely in relation to Methyl Violet 10B, and more generally as Crystal Violet to avoid possible confusion. It destroys cells and also binds to DNA, so is potentially mutagenic and should never be taken internally. Note that it is not 120°-symmetric, but only bi-symmetric. Also, it is a polar molecule, with charges separated (note the chloride ion), and does NOT occur naturally.